Discover a place where boredom is impossible. Barceló Punta Cana is set along the white sands and turquoise waters of Bávaro beach, where your family can enjoy surfing, sailing, snorkeling, and diving. The hotel is nestled among exquisite tropical gardens, and features elegant rooms and suites, seven specialty restaurants, a water park for the kids, and swimming pools with views of the Caribbean. Members will receive a one-category room upgrade and up to 5% cash back off their room rate upon return. 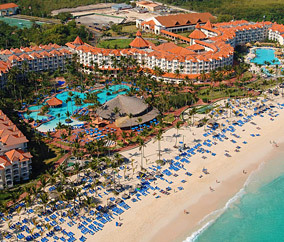 Barceló boasts over 100 hotels in 19 countries, making it a simple choice, no matter where you vacation. Each location features exceptional accommodations and incomparable service, not to mention the most beautiful ocean views around.